The USA had six Apollo landings, the last three having electric powered dune buggies to transport samples and astronauts considerable distances from the landing site. Russia had seven Luna missions of unmanned robots, some of which took samples at the landing site and a few of which used a robot vehicle to drive around a little. The Apollo samples are biased to the flat lowlands because it was safer to land there. Apollo 11 and 12 were cautious missions landing on the flat lava plains of Mare Tranquillitatis ("The Sea of Tranquility") and Oceanus Procellarum. The Apollo 13 mission was aborted. Apollo 14 landed on the ejecta blanket around the vast Mare Imbrium impact basin. Apollos 15, 16 and 17 used a "roving vehicle", that is, an electric powered car to transport samples and the astronaut for much longer distances than feasible on foot. Apollo 15 landed at the edge of the lava plane inside Mare Imbrium, taking samples of both the Mare and the foot of the Apennine Mountains which form the rim of the Imbrium Basin (and which straddle the intersection of Mare Serenitatis and Mare Imbrium). Apollo 16 was the only real highlands landing of the U.S., albeit close to and surrounded by mares. The lunar module landed on a slope at a harrowing 15 degree angle. Apollo 17 was sent to the edge of Mare Serenitatis, where scientists had misinterpreted an unusually dark area as possible recent volcanic deposits. Instead, they were 3.8 billion year old lava deposits. The seven Soviet landings were all in either the mares or in mare rim mountains. All samples come from the lunar nearside, in and around the mares, due to communications problems with Earth from the far side. The far side is almost all highland material. The lava flows forming the mares occurred almost exclusively on the side of the Moon facing the Earth. The Moon has kept one side facing the Earth from nearly the time of its formation due to gravitational tidal forces, and the Earth's gravity may have contributed to the flows of lava on the nearside. The Moon is pictured below. The highlands are the bright areas, the lowlands dark. Note the huge size of the asteroid craters which created the mare. 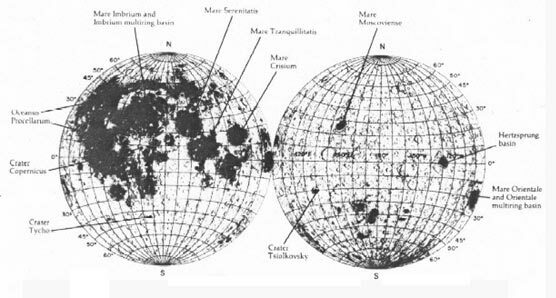 The Moon is a 3000 kilometer (2000 mile) wide planet, so some of those craters and resultant lava plains are hundreds of kilometers wide. The average composition of the Moon's highlands and lowlands based on the average Apollo samples are also given below, and for comparison are set alongside the average composition of Earth's crust. Keep in mind that we have limited highlands samples since the Apollos landed in and around the safe, flat lowlands areas, except for Apollo 16 which landed in a semi-highlands place as discussed above. Glasses, ceramics, etc. Solar cells. Fuel propellants, life, chem. proc. Chemical analysis in weight parts per million. Extracted from General Dynamics/Convair study under contract to NASA.